Ooh, I love PBs like this! They are so helpful to parents. Sighs...I remember when... Thank you for sharing it! 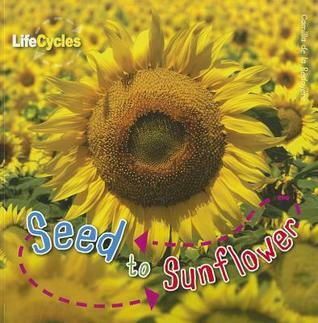 What a beautiful book about life cycles. The cover really grabs you! Some years ago, my husband and I grew sunflowers. The large blooms towered over us, suported on their sturdy, tree-like stems. The centers filled with plump seed pods we planned on picking the following morning. After breakfast, we each brought a large dish outside only to find that a famished family of chipmonks had their breakfast long before we did. Not one seed remained. Loving sunflowers as much as I do, I know I'm going to enjoy your PPBF selection. We had huge sunflowers here too. Looks like a wonderful story for kiddos to learn about gardening. Beautiful striking book. Love anything to do with flowers and gardens that help kids. Great find.